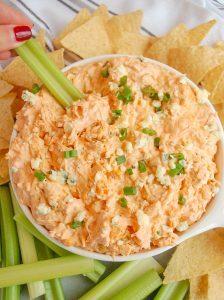 Spicy, creamy, and delicious healthier buffalo chicken dip made with lighter ingredients and will leave you feeling good after indulging in the best party appetizer! Made with lightened up dairy and buffalo sauce, this makes for the best healthy game day snack! 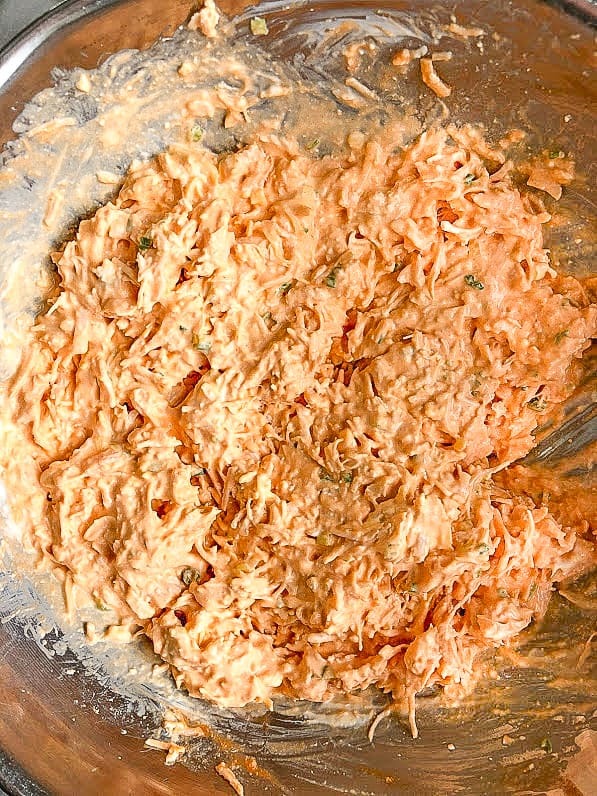 So although I have wanted to put up a recipe for healthier buffalo chicken dip for the longest time, I held back from doing so because I’m pretty sure there are a million recipes for buffalo chicken dip on the internet! And for good reason! 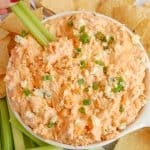 What is a game day or Super Bowl party without one of these creamy, spicy, and tangy dips?! Not a party I want to attend! It’s one bite into that dip and I’m instantly understanding why buffalo chicken dip is one of the most popular recipes on the internet, it’s just THAT good! However, a few years ago I went to a party and someone brought a healthier buffalo chicken dip that just wasn’t good…it was like taking away all the original characteristics of the beloved original recipe and just tasted ‘healthy’. You know what I mean? When things can taste like they have been made healthy and really just don’t taste good at all? So this football season I made it my mission to come up with a buffalo chicken recipe that doesn’t have that healthy taste but is actually not loaded with nearly as much fat as the original recipe. And hey, while I’m always down for the real thing, this recipe will honestly leave you feeling good. I made it for New Year’s Eve alongside my buffalo chicken meatballs (I told you we really like buffalo chicken stuff) and another girl at the party had made the original recipe. Battle of the buffalo chicken dips. And since we all know there is no such thing as too much of it, both of them went so fast. I took that as as sign that mine was a hit. 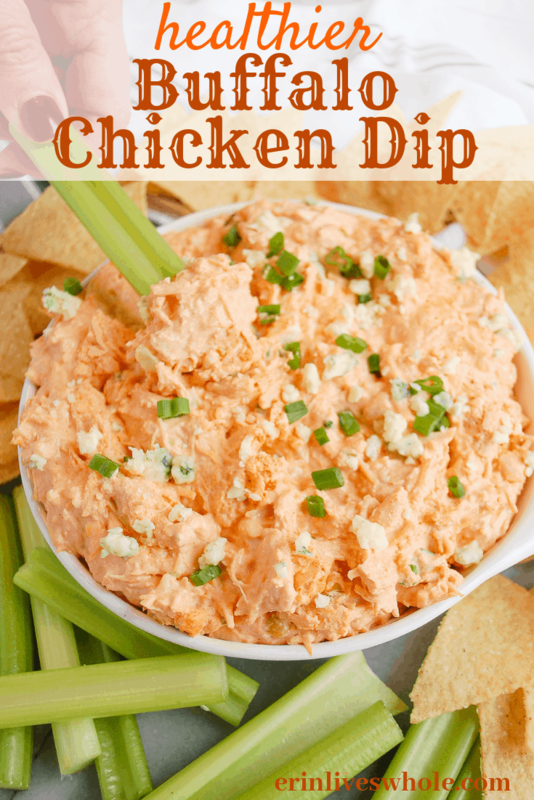 My boyfriend, who bless his heart is one of the most honest people I know, told me that this was seriously one of the best buffalo chicken dips he has ever had, and that boy has seen plenty a dips at tailgates and watch parties! Part of the reason why I love it is because it isn’t trying to use any special ‘healthified’ ingredients. It’s just the real deal stuff and real deal food, but in lighter varieties. 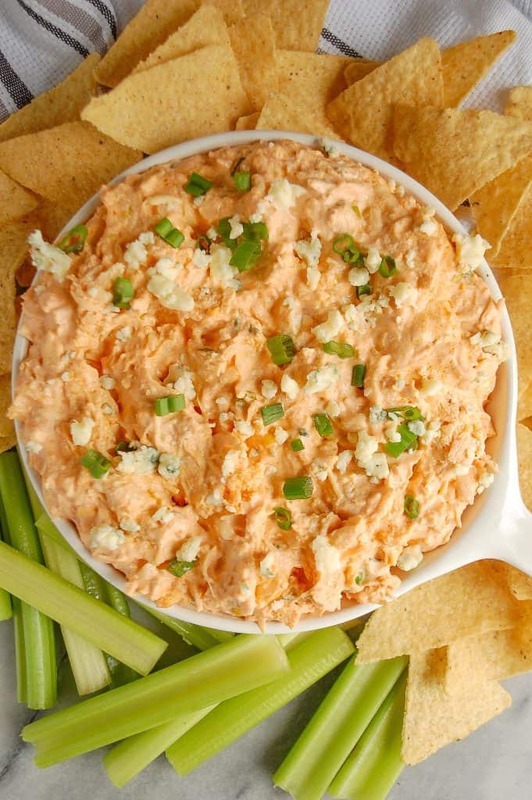 All you have to do is mix everything together and pop it in the oven and you’ve got yourself one heck of a delicious healthier buffalo chicken dip. 1 8oz package light cream cheese or Neufchatel, softened. Preheat oven to 400F and grease a baking dish. You can use any round or square dish around 8×8. If using bigger, reduce cooking time. In a large bowl, shred chicken with fork. Add in softened cream cheese, hot sauce, cheese, and greek yogurt and stir until combined. Mix in green onion, garlic powder, and onion powder. Bake in oven for 16-20 minutes or until bubbly throughout. Top with blue cheese and more green onion and serve immediately. I like to serve mine with veggies and tortilla chips.